Alvin B. Thompson, age 91 longtime resident of Tonkawa, Oklahoma, passed away Tuesday August 22, 2017 at his home. Friends and loved ones may pay their respects at the funeral home from 10am until his funeral ceremony which will be held at 2:00pm Monday, August 28, 2017 at the Trout Funeral Home of Tonkawa with Brian Friend officiating. 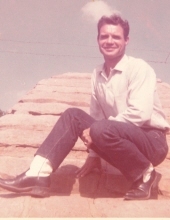 Following the ceremony, he will be laid to rest at the Red Rock Cemetery in Red Rock. Casketbearers will be Alvin Leroy Thompson, Jamie Lee Thompson, Melvin Leroy Allison, John Bannister, Chet Cook, Dennis Epperly, Ashley Allison and Justin Epperly. Arrangements are under the direction of Trout Funeral Home & Cremation Service of Tonkawa. Alvin was born on January 3, 1926 to Ben Thompson and Ruth Fields in Cushing, OK. Nellie Cook became his wife on June 12, 1965 in Cushing, OK. Through the years, Alvin had worked for the railroad, the Ranch Drive COOP, the Tonkawa COOP, and Atlas Tank in Tonkawa. Hunting, fishing, and tending to his flowers in the garden filled his time. Above all, he loved his grandkids who lovingly called him "Papa." Survivors include his wife, Nellie Thompson of the home, children: Alvin Leroy Thompson and wife Janese of Arkansas City, KS, Karen Coffman of Newkirk, Judy Thompson of Plano, TX, Chet Cook and wife Brenda of Ponca City, Brian Thompson of Tonkawa, and Cora Hisey of Ponca City, sister Erma Sargent of Perry, OK, 13 grandchildren, numerous great grandchildren, nieces, nephews and friends. Alvin was preceded in death by his parents, sister, Mary Ella Barnes, and daughter in law Karen Sue Thompson. To send flowers or a remembrance gift to the family of Alvin B. Thompson, please visit our Tribute Store. "Email Address" would like to share the life celebration of Alvin B. Thompson. Click on the "link" to go to share a favorite memory or leave a condolence message for the family.